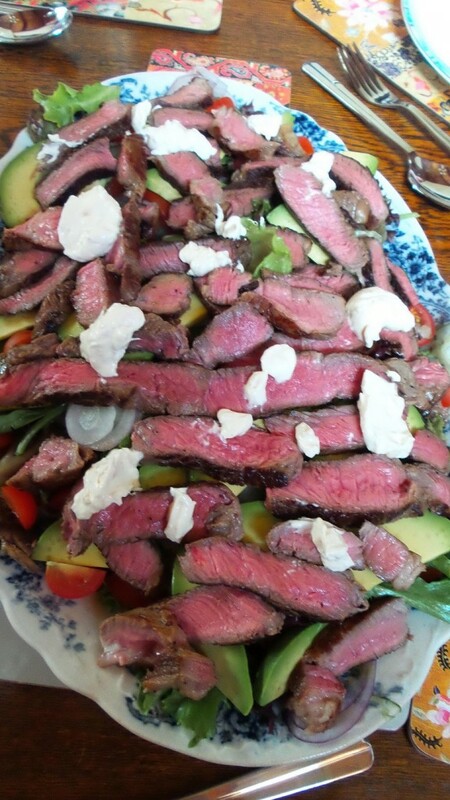 Like many people – I knew of Gaucho’s but had never actually been. I’m not entirely sure why – it has a solid and long lived reputation and I love steak. But the allure of the shiny and new always gets in the way, I guess. So when I received an invitation to the new menu launch, I was there – like the proverbial rat up a pump. The executive summary (TLDR) is that YOU SHOULD GO. If you haven’t been before – go. If you haven’t been for a while – go. If you went last week – maybe give it a month or so before heading back. As is probably quite evident, I go to a fair few blogger/media events and quite often how well they work depends a lot on the venue ‘getting it right’. This is rather broad (and vague and may be the subject of a future post) but on this occasion, Gaucho’s got everything bang on. I guess that’s 30 years of experience in the business for you. Our group of around 20 (ish – I didn’t do an exact head count) was seated in Gaucho’s back room stretching across one wall. We had a short introduction before moving on to the serious business of both food and wine. Food wise we were treated to a spread of dishes that covered new and old on the menu. Now – a word of warning. You may be aware that Argentina is a big beef producing (and eating) country. That would be correct and it is very fair to say that Gaucho’s menu reflects this. It is meat, meat and more meat. And then some fish and shellfish. If you’re a vegetarian be prepared for an extremely limited choice. As in – two dishes. 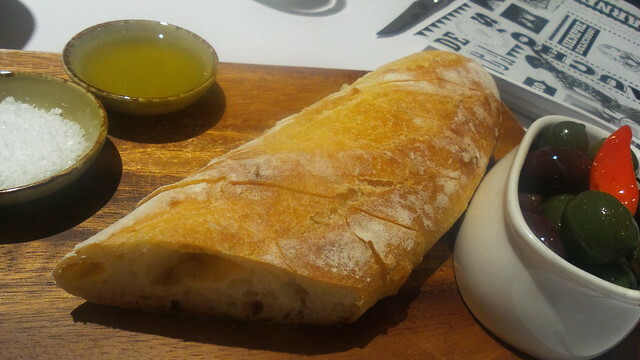 We started with bread and olives. Gaucho’s olives are finished off in-house and marinated in chilli, paprika, lime and tequila. They are served warm. And they are delicious. You get the warmth and spiciness of the tequila softened by the richness of the olives. Good stuff. Then the dishes really started coming. Picada con berenjenas en escabeche is a charcuterie platter, including ox tongue, prepared in house, along with pickled eggplant and pickles. I loved that this included the delicious house pressed ox tongue (in my opinion there is not enough offal on menus in Adelaide). We also had the empanadas (a vegetarian option is available) as well as the baked provolone cheese and some chorizo. Of course, being essentially a steak house the star of the meal was the bife de chorizo. 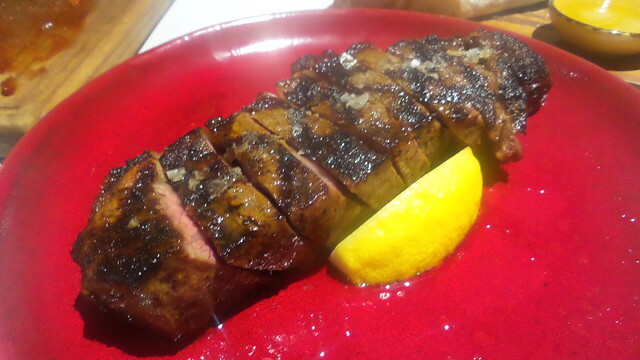 From Riverine in NSW (hats off to Gaucho’s for including the provenance of so many of its meats) and aged for 42 days, this is described on the menu as a ‘New York strip steak’. You can see from the photo that it is a dead ringer for a sirloin (porterhouse) and when I had a google, it appears that New York strip and sirloin are indeed the same thing. It was beautifully cooked and served, as you can see, with just a wedge of lemon. As this is a mere (!) 450g you might find it a bit much to demolish on your own, but something I’d definitely recommend sharing. You can order additional sauces for your steak but it’s so good you don’t really need anything (except maybe a touch of the chimichurri that’s on the table …). We were also treated to Gaucho’s new paella. Gaucho’s is famous for its oysters and Beerenberg has now partnered with Gaucho’s so you can buy both the Diablo sauce (used for the signature ostras del diablo) and Chimichurri sauce in supermarkets around Adelaide. 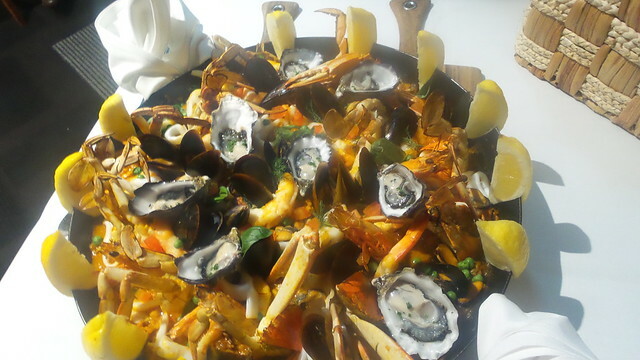 The paella came with plenty of oysters, squid and other seafood and did a fantastic job of showcasing that Gaucho’s does something other than a mean steak. It’s not surprising that all of this did a solid job of filling us up so we didn’t really need dessert. 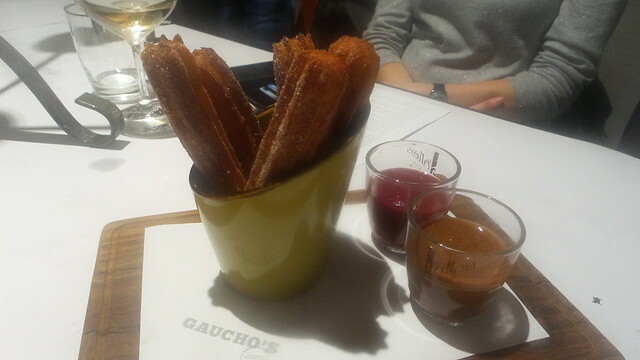 But after a little pause, out of the kitchen came churros to share. You can never go wrong with deep fried batter served with salted caramel sauce! 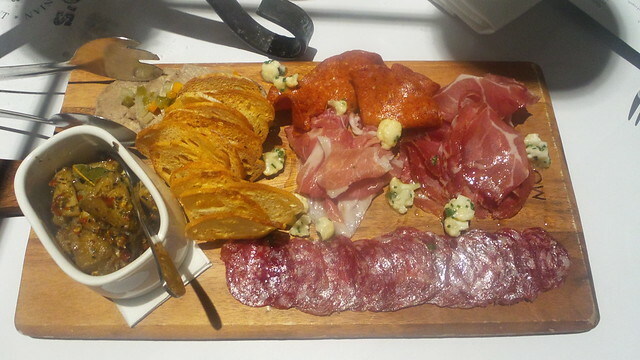 For me – the meats were the absolute stand out of this meal. I have recommended Gaucho’s several times since and I am planning to head back as soon as one particular friend visits from interstate. The food was great, the staff were efficient and friendly and the whole dinner just worked. Gaucho’s might not be the newest, trendiest kid on the block but its years of experience really shows. A definite thumbs up! Friday was Pi Day. The humour in this is limited – if you write dates in the American format it was 3/14, and pi (the mathematical constant) approximates to 3.14 (if you’re dealing with 2 decimal places). The connection between all of this and pies is tenuous at best. But we’ve also had a burst of relatively cool weather in Adelaide so for starters I’m more than happy to consider switching on things that generate substantial heat. And I’m also happy to consider eating pie. A hot, home made pie for dinner is definitely cold weather food. I found this pie recipe on the MiNDFOOD website and tweaked it a little, not least of all because pies have pastry on both the bottom and the top! Green peppercorns are a great ingredient to cook with: they add bursts of pepperiness along with a hint of sharpness. Just make sure you rinse them first (they will come in brine). You do need to factor in plenty of time for both cooking and cooling the pie filling. You can’t rush the beef being tender and, especially if you are doing a pie properly, you need the filling to be cool because if you hit the pastry with hot pie filling you’ll end up with the dreaded soggy bottom! 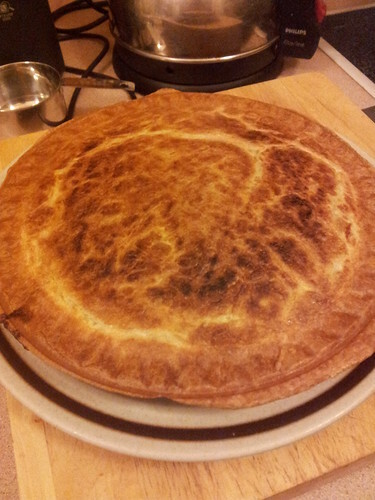 We used our piemaker for this and bought pastry (both shortcrust and puff – yes, sometimes dinner just has to happen!) so once the pie filling was complete the actual pie could be be assembled and on the table in about half an hour (20 minutes of that was cooking time). If I were serving this to others, I would bother to at least make my own shortcrust, use individual pie dishes and cook them in the oven. At least … that’s what I tell myself! Preheat oven to 140°C (fan, or 160°C conv). Heat some olive oil in an ovenproof casserole dish and brown the beef in batches. Set the beef aside and turn down the heat. Add the onion and garlic and soften. Stir often. Return the beef to the pan and sprinkle over the flour, mixing well. Allow this to cook for a minute or two, before adding the stout, stock and thyme. Bring to the boil and then take off the heat and put, covered, in the preheated oven. Cook for about an hour and a half until the beef is meltingly tender. If the gravy is still a little thin, return to the stove and remove the lid - but keep a close eye on it and don't over thicken. It should be no more than the consistency of a thin cream. Allow to cool a little before adding the cream and pepper corns and set aside to cool fully. The cooling and the addition of the cream will thicken the gravy further. If using a pie maker, preheat and cut the base (shortcrust) pastry. Line the pie maker, fill (take care not to over fill!) and top with the puff pastry. Cook for the recommended time (in our case 20 minutes) and serve immediately.